It has been designed to measure the components of health status that are believed to be most affected by FM. The FIQ is a self administered instrument that takes approximately 5 minutes to complete. The directions are simple and the scoring is self-explanatory. The FIQ is composed of 10 items. 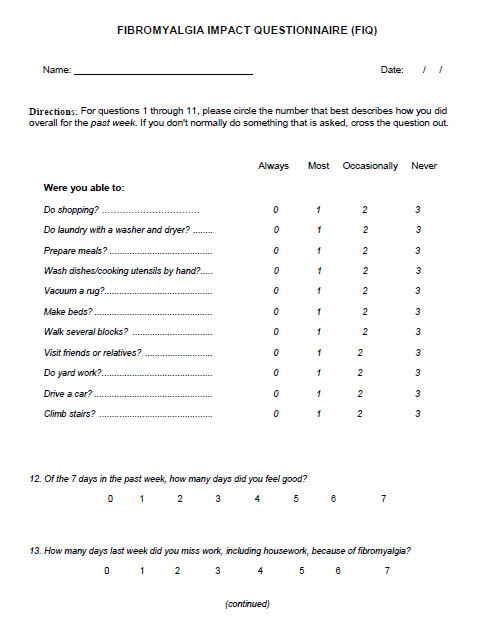 The first item contains 11 questions related to physical functioning – each question is rated on a 4 point Likert type scale. Items 2 and 3 ask the patient to mark the number of days they felt well and the number of days they were unable to work (including housework) because of fibromyalgia symptoms. Items 4 through 10 are horizontal linear scales marked in 10 increments on which the patient rates work difficulty, pain, fatigue, morning tiredness, stiffness, anxiety and depression. Burckhardt CS, Clark SR, Bennett RM.The fibromyalgia impact questionnaire: development and validation.J Rheumatol. 1991 May;18(5):728-33. This initial assessment indicates that the FIQ has sufficient evidence of reliability and validity to warrant further testing in both research and clinical situations. ↑ Burckhardt CS1, Clark SR, Bennett RM. 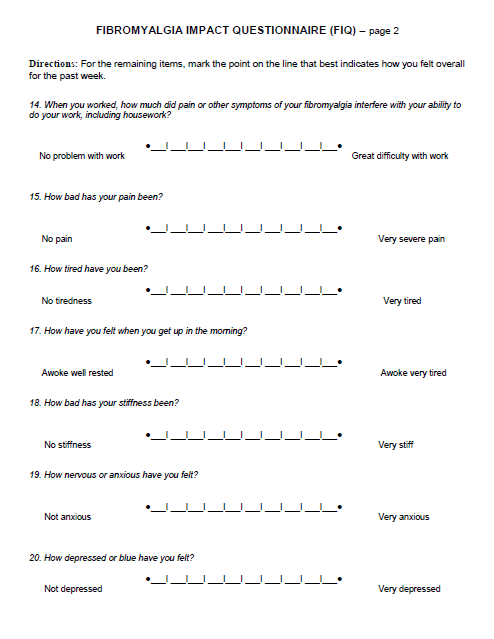 The fibromyalgia impact questionnaire: development and validation.J Rheumatol. 1991 May;18(5):728-33.